I was about fifteen minutes late for the start of Marina Abramovic's November 15, 2005, appearance at the Guggenheim Museum, a re-performance of her 1975 body-art action, The Lips of Thomas. She was using a razor blade to cut the first line of a five-pointed star drawn on her stomach. The place was packed. 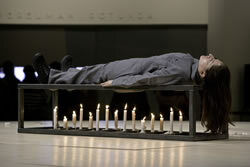 Abramovic, naked, was installed on a round platform in the middle of the rotunda. Spectators filled the floor in front of her and lined the first few spirals of the museum's ramp, with a scattering higher up. Although one could safely assume that those on the floor had come to see Abramovic, at least some of the others must have been caught on their descent from the museum's concurrent Russia! exhibit. When the first cut was complete, Abramovic blotted it with a white cloth. Slipping her feet into boots that waited nearby, putting on a military cap, and picking up a heavy wooden staff, she stood and cried, her belly heaving, tears streaming down her cheeks as she, and we, listened to a Russian folk song. She lay down on blocks of ice arranged in the shape of a cross, her body shaking; then knelt on the floor and whipped herself; finally sat at the table and slowly ate a spoonful of honey and took a sip of red wine. Abramovic repeated these actions, varying the sequence, until midnight. A metronome ticked away. She seemed to be pacing herself. In 1975, she had performed the actions in the sequence described in the program: she ate a kilo of honey, drank a liter of red wine, broke the wine glass with her right hand, cut the star on her stomach, whipped herself until she no longer felt pain, and then lay down on the ice. Thirty years ago, the spectators (in a gallery, not a museum) ended the piece by removing the ice after 30 minutes. Some of them were surely familiar with Abramovic's earlier Rhythm series, from which she required rescue more than once, and with other actions she had performed that same year: Art Must Be Beautiful. Artist Must be Beautiful (in which she brushed her hair simultaneously with a metal brush and metal comb until her face and hair were damaged); Role Exchange (she exchanged places for four hours with an Amsterdam prostitute); Freeing the Voice (she lay on the floor with her head tilted back and screamed for three hours, stopping when she lost her voice); Freeing the Memory (she free-associated until no more words came to her); and Freeing the Body (she wrapped her head in a black scarf and moved to a drumbeat for eight hours, stopping when she collapsed). Given the explicit feminist orientation of Artist Must Be Beautiful and Role Exchange, and the theme of a painful liberation from constraints and social conditioning in the other three actions, in 1975 one might have reasonably read The Lips of Thomas as a ritual escape from a repressive culture. The Christian references in the flagellation and the cross of ice are obvious, and some spectators might recognize the honey and wine as elements of Orthodox ritual. The star reads as a symbol of Yugoslavia's Communist regime. Abramovic uses her body to manifest sources of conflict and suffering, and spectators invest these cultural traces with unpredictable personal significance. Many are no doubt oblivious to the symbolism and register only the piece's ritualistic aura. The event was a test of endurance for spectators as well as for the artist. Each person had to decide when to leave, whether to stay through the boredom and the pain of standing for hours or sitting, unsupported, on the floor. Aside from the half-hour I spent (with some guilty feelings) in the museum café, I stayed with Abramovic until midnight. Placing real physical pain within an aesthetic framework throws the spectator's ethical relation to the spectacle into question. My own engagement with painful performance is born of a desire to understand what happens when we watch such spectacles and why we do so. Yet I remain disturbed by my interest and reluctant to look: I cannot ask another person to injure herself in order to observe my own response. I can ask someone to play Ophelia for me or to dance Giselle, but how can I ask her to slice her skin, even if I know that she is a "cutter"? This was certainly no "command" performance undertaken for me, but Abramovic solicits her audience's emotional engagement by offering up her pain. I talked to other people who felt, as I did, that we owed it to her to stay. In fact, she has defined the exchange of energy with her audience as her primary interest since the late 1990s, and for long intervals between actions, she simply gazed out at us. Aside from this sense of responsibility, I also wanted to see what would change for me, and for her, over the course of seven hours. When the time was up and the guards began trying to empty the museum, the still sizable audience applauded for perhaps ten minutes. As the night went on, each variety of action took on a different valence: the wine and honey seemed to nurture and soothe her, the flagellation to purge, in contrast to the purely passive ordeal of lying on the ice. Abramovic eventually stopped jerking around on the ice and crying out as she lay down on it. By 8:00, however, she continued to shiver as she sat at the table after lying on the ice, her body trying hard to warm up. After whipping herself, to which she continued to react vocally, she looked intent, energized, powerful. The flagellation seemed to me like an athletic event. Perhaps because I knew The Lips of Thomas so well as a piece of body-art history, I watched the cutting action unmoved. But the space became very quiet at those points, no movement, little whispering. On the third cut, someone called out, "you don't have to do it again." Obviously others were more disturbed by it than I, and many turned away from the flagellation. I had a strong desire to read Abramovic's affect throughout, but her reaction to the ordeals seemed largely physical. Her face remained impassive as she cut her stomach, in sharp contrast to her weeping during the "Young Communist" segment, which was not part of the 1975 action. In addition to wearing the cap and boots this time, which evoked her Eastern Bloc upbringing, she sometimes opened out the cloth with which she blotted the cuts on her stomach and tied it to the staff, waving it as a flag. These accessories and the music suggested an association between her tears and the pain of memory, clearly marking Abramovic's cross-over from the visual art world into a performance genre more closely allied with theater. The entire week-long event at the Guggenheim smacked of theater, a fact that met with distaste from some fans of conceptual art. During the week, Abramovic also re-performed Bruce Naumann's Body Pressure (1974), Vito Acconci's Seedbed (1972), VALIE EXPORT's Action Pants: Genital Panic (1969), Gina Pane's The Conditioning (1973), and Joseph Beuys's How to Explain Pictures to a Dead Hare (1965). The museum provided a program with the name of each night's piece, the originating artist, its performance location and date, the original duration of each event, and a statement by the originating artist. In a letter to the New York Times, the performance artist and sculptor Tom Marioni objected that Abramovic thus became an actress, not an artist. Clearly this distinction remains important to Marioni and to Chris Burden, who would not cooperate with the project. To me, the more interesting point is that Abramovic herself has been pointedly blurring this line for fifteen years. In the mid-1990s, she told Beatrix Ruf and Hans-Peter von Däniken: "In the seventies, the theater was the enemy of performance artists. It was considered a fake, a staged experience. In the nineties now, my attitude has changed completely.… The audience who now come to the theater to see my work see both a stage-play and a performance." Abramovic first re-performed The Lips of Thomas in European and American theatres and opera houses in 1993 as part of a work called Biography, which used a recorded autobiographical narrative to contextualize the brief re-enactment of many of her early art actions. The elements of The Lips of Thomas that she chose to include, the star-cutting and the flagellation, referred not only to her personal history but also to an opposition between God and the state upon which she focused in telling that history: Her mother was an atheist and partisan, her father a communist, and both parents participated in Yugoslavia's Communist Revolution. Interestingly enough, her maternal grandfather was a Patriarch of the Orthodox Church, making her childhood a mixture of military discipline at home and religious life with her grandmother. By re-inscribing these symbols with the details of her personal biography, Biography made them both concrete and mutable. The Guggenheim version replaced the narrative with costume, props, and the song "Slavic Souls," sung in Russian with a xeroxed translation available at the entrance desk. The actions thus hovered between theatre and anti-theatrical body art. There was no question of the artist losing control. And like the proscenium stage configuration that separated Abramovic from her audience when she performed Biography, security precautions at the museum eliminated the ready access to the performer's body that was part of her gallery settings in the 1970s. There was no possibility for spectators to end the action by "rescuing" her and no danger of provoking that sort of intervention. More than anything else, Abramovic's re-performed body art actions served this time as icons for spectators familiar with her work. Seven Easy Pieces, dedicated to Susan Sontag and curated by Nancy Spector and Jennifer Blessing, provided a most unusual opportunity to encounter this kind of work in the flesh. For all its visceral impact, body art is always mediated, if not by recordings and reports then at least by the framework within which it is performed. Consider the title of this piece, the meaning of which is hardly self-evident. Because I have never come across an explanation or even a discussion, I initially put the title together with the sacrificial imagery and thought of "Doubting Thomas," who finds proof of the resurrection in touching the lips of Christ's wound. I then added in Abramovic's stated desire to produce gaps in her audience's understanding: She told Hans Ulrich Obrist that her performances, like the sculptural objects that she creates, are designed to create for the spectators "some kind of mental gap so that they can't explain it rationally. They will look for tricks, and when they can't find the trick . . . their knowledge . . . will have to collapse . . ." and "they will have a completely different way of seeing things." 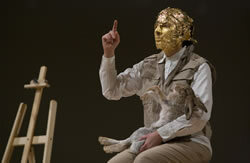 I can't say that the performance caused my knowledge to collapse, but Abramovic's aim makes sense of her title. The Lips of Thomas positions her body and its sensations, pain most particularly, at the center of a mystified circle, available for perception but defying rational comprehension. Yet I suspect that she had in mind a different Thomas; that is, St. Thomas Aquinas, whose Summa Theologica addresses the question of whether God should be praised with the lips. After noting all the scriptural arguments for and against verbal devotions, Aquinas answers that we praise God with our lips to arouse our own devotion and that of other people, but that "it profits one nothing to praise with the lips if one praise not with the heart." Read in this context, Abramovic's wordless Lips of Thomas pulls her heart back and forth between her family's incompatible Christian and Communist devotional practices. I don't know how far other members of Abramovic's audience at the Guggenheim went to interpret her title, or how much they knew about her life and work. But certainly everyone was aware that she was re-performing art actions that had originally been performed some 30 years ago in a different context. To be a member of the audience for conceptual art typically entails "consuming" the concepts behind the events, and a significant part of the ultimate "audience" for such events never witnesses them. Many, in fact, never even see photos or videos. Word of mouth has an important impact, for both the consumers and the performers. Abramovic, for example, told Janet Kaplan that she heard as a young artist in Yugoslavia that Chris Burden was arrested after being crucified on a Volkswagen that was driven around Los Angeles. In fact, Burden's Trans-fixed (1972) was much less dramatic: after a doctor affixed Burden to the car with nails, a few friends pushed it out of the garage, took the picture, and pushed it back in. Yet the story that Abramovic heard in Yugoslavia influenced the challenges that she set herself during the mid-1970s and sparked her desire to re-perform the performances of other artists--a desire finally fulfilled at the Guggenheim in 2005. Knowing all this, one cannot help wondering what stories and desires Seven Easy Pieces will eventually spawn.